We started out the week with meetings! We had a survey team meeting on Monday, which meant I had more updates to do in Qualtrics for Section 1! Section 1 is *actually* almost done now (I feel like I've been saying that for weeks now, but it is actually true!!). We also had a meetings on Tuesday with Sam and Helen about writing papers. Sheri sent us more paper suggestions, which Michelle and I liked, so we decided we are going to do those. We are not abandoning our other projects, but we think it's much more feasible to do the other papers (Delta Design and survey research) so we're going to try to work on both. Sam and I had a chance to talk about the papers she sent me related to the what is engineering topic that I want to look more at, which was helpful. I'm going to be looking at the interview data some more, and seeing what I find and any other possible questions I come up with. We also had a meeting with Helen about our ePortfolios. We talked about who we want to look at them, besides the people in undgergraduate advising, like people in industry who might be looking at this to potentially hire us, and maybe graduate school admissions. We came up with specific questions we'd like them to answer, about the content and if there is anything missing they would like to know and what should be taken off. I also decided on Tuesday to go with some friends on a road trip to Las Vegas for a hacking conference that weekend. Since we were leaving Thursday afternoon (yes, 2 days later, haha), I suddenly had lots of work to get done before I left. First, I then spent lots of time working on finishing my portfolio to get it into a presentable state because Helen wanted to start showing it to people at the beginning of this week. I added more pictures, finished tweaking things, and had it reasonable-looking by then. Obviously, I'm still going to be working on it, but I'm done with drastic changes. I also had to finish Section 1 edits in Qualtrics because we finally had a demo to Sheri on Thursday morning (yay another meeting!). We are really happy with using Adobe Connect to share one screen so we are all looking at the same page, this helps the productivity of our meetings. That meeting went well, I again came away with more edits, but it's almost there! Michelle and I also worked a bit on Delta Design. We are in the process of recruiting some friends to test it with, so we will be working a lot more on that this week. We need to re-write the instrucitons and try to balance the difficulty appropriately, and hopefully we'll test a full run-through next week! My week was full of fun stuff! Monday night, we went to the movies. We also made apple crisp, which was delicious! And of course, the highlight of the summer was this last-minute trip to Vegas! So there's this hacking conference there every year. Some of my friends from my NASA internship 2 summer ago have been going the past several years, and have been trying to get me to go, but it's not really my thing, so I haven't been before. But this time, one of my friends applied to speak, so I said if she was accepted, I would come. She was accepted, but then I thought I would be going home that weekend for a wedding (it's actually next weekend), so I didn't get plane tickets. Well, neither did she, so with a couple other people, we planned an epic last-minute road trip, so I was able to go! And I'm SO glad I did, it was super fun and quite an adventure! It was really nice to have a reunion with those NASA friends, the conference was much more fun than I was expecting (it's a bit hard to explain, but it's not a very serious conference. Lots of people (but not me), speakers included, start drinking in the morning and don't stop. Many of the talks are hilarious (some are much more technical than others, and some are quite serious, but some are random and funny). There are also lots of contests, ranging from hacking things to a beard competition. You can get a mohawk (and lots of people do), learn to pick locks, and solve a complex puzzle with the badges. The guy-to-girl ratio was something astronomical (we estimated it was about 3% female out of around 11,000 people. Great for me, there were NEVER lines for the women's restrooms!). Sleep did not happen much.) I'm so glad I went, I'm already looking forward to going again next year!! 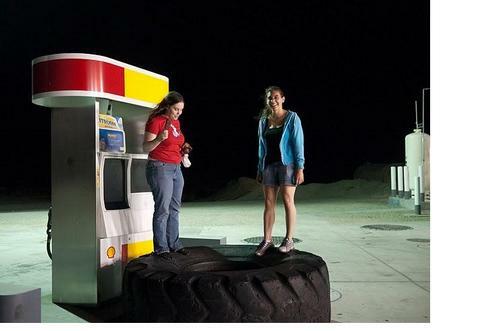 When we stopped for gas in the middle of nowhere, we found a giant tire!